Woodstock Lodge #246 was granted its masonic charter on 27 October, 1870 by the Grand Lodge of Georgia. Being chartered in 1870, Woodstock Lodge is one of the oldest lodges in Georgia, and has been active with regular meetings and community involvement ever since. Originally known as Little River Lodge, the lodge name was changed during the last century to Woodstock Lodge, the name by which it is known today. In 1945 another local lodge, Sweats Mountain Lodge, combined with Woodstock Lodge, thus forming a single lodge for the Woodstock area. A masonic lodge always has a facility for fellowship,and as a place to conduct the business of the lodge. During its 138 year existence Woodstock Lodge has been located in a few buildings, even above what is now the bicycle shop on Main Street, in Olde Woodstock. The lodge is now located at 688 Arnold Mill Road, where it has been for less than 10 years. The first Worshipful Master of Woodstock Lodge was M Chambers, and since then the lodge has known 91 Worshipful Masters, several having served multiple terms in this most senior role in the lodge. Although now located outside the center of olde Woodstock, the memory of the lodge and Woodstock masons in the heart of the City of Woodstock is still reflected. Next time you are on Main Street, take a look at the mural at the intersection with Arnold Mill Road. 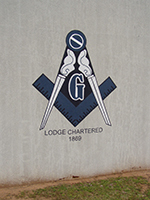 There you will find the most definitive of masonic symbols, the Square and Compasses, which is to commemorate the important role this lodge has played as the City of Woodstock has developed. You may notice that the mural says the lodge was charterd in 1869, this was actally the year the charter was applied for, but it wasn’t granted until 1870.